Flickr is Biggr and Spectaculr! Flickr launched a new layout, new pricing plans, and lots of perks for free accounts! I’m a big fan of Flickr, obviously. I’ve used Flickr since June 2007, and it hosts all of my blog photos. Without Flickr, JuicyBomb would not be as awesome. 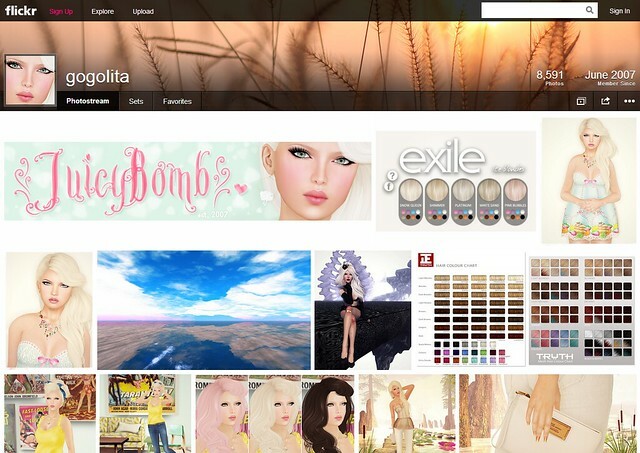 I really enjoy the Second Life Flickr community, and being able to catch up on all the pretty SL photos in one place. I’ve seen some people gripe about the layout; but I think it”s okay. Embrace change, you’ll get used to it. Being Second Life residents, we’re used to craaazy changes by now! 😀 I’ve learned to deal with drastic changes, that’s one thing that SL has taught me over the years. The new pricing plan (Ad Free, Doublr) is more expensive than before, but you don’t have to pay for it. The free account now offers much more than before, and is nearly identical to the old Pro Account perks. Is 1 Terabyte enough storage space? Yes, probably. I have over 18,000+ photos stored in my Flickr account, but only about 8,000+ are public. The rest are photos that are unedited or photos I’ve uploaded to make collages. According to Flickr, 1TB is equal to about 500,000 photos. My account is turning 6 years old in June, and I would say that I take more photos than the average SLer, so I think that it’s safe to say, that 1TB will be just fine. Why am I keeping my Pro Account, even though many features are now FREE? Cos there are still a few perks that are not available to everyone. Which Features are Still Limited to Flickr Pro? The old Flickr Pro accounts included unlimited storage space, and that means it can exceed 1TB. Flickr Pro users also get to view counts and referrer statistics for their images. Lots of professionals often like this feature because it shows where a photo has been used or linked across the web. Flickr Pro users can replace photos (without having to reupload), archive high-resolution original images and enjoy an ad-free experience. I looooove that I can replace a photo, and not lose all the favs and comments. I’m keeping my Pro Account, if I ever exceed 1TB, I can still keep the old $24.95 pricing, and not have to pay $49.99 for Doublr! Read this article (What The New Flickr Means For Free and Pro Users), they have charts posted comparing the old free account vs. new free acount. Do you have a Pro Account on Flickr? Will you be keeping yours, or downgrading to Free? If you have a free account, how do you feel about the new perks (hopefully you love it, cos it’s awesome!). for me, this change has been fantastic. i didn’t renew my pro account when it expired last year, so having access to all my older photos now is great. i’m still not positive if i love the new front page layout or anything, but i’m open to change.. it just takes a while to get used to, is all. I’m pretty torn about this change. I can handle the new interface, I’m learning to like it. What I’m concerned about it the pro account. I’m not worried about storage or upload sizes, the biggest reason I went PRO was to post in 60 pools (which I get to keep) and because of statistics. I’ve read a few articles about the changes, and I haven’t seen any clear answers about statistics. Does Pro get to keep them? If yes, is it worth it to me to stay pro? Well, I have only been pro 6 months, so I think my rate would be $50, but thats 4 bucks a month, not bad. Once I know for sure what I can get with pro, then I’ll decide if I want to keep it or not. But it seems to me that they want us to downgrade to free, for the ads. Why else would they charge $50 to go ad free? When before it was $25. Also, charging $500 for 2 terabytes? Seems a bit crazy to me. If I needed that much, I’d make two accounts, lol. Honestly, I’m only worried about statistics at this point, I like seeing how things progress. Pro accounts still get to keep the statistics. The only bad thing is, we don’t get the new larger sizes available to free accounts, unless we downgrade to free (but will lose the pro account 24.95 renewal rate). I’m okay with the 50MB pic size limit, but the new limit is 200MB. It all depends on which features are important to you, I guess. I like stats, too. And also the “unlimited” storage. I love the new Flickr layout – I think it was overdue for a new look! I didn’t like the home page at first because of the huge pictures everywhere, but I’m used to it already and I like that I can favorite pics without clicking through to them. But after thinking about it and reading an article on the other changes, I switched back to a free account just because I don’t really care that much about the stats and I’ll never need more space than what is offered anyway. Of course now that I cancelled it, I’m afraid they are going to change the free account again and I’ll be screwed without Pro LOL. All in all, I think the new Flickr is pretty nice! I can’t believe some people are threatening to go elsewhere over it instead of giving it a chance. You were always able to change the size of the photos. There was small, medium, “justified,” large, etc. You are right. It doesn’t as of yesterday. Everything is set to justified. Flickr will lose the bulk of their paying clients due to these changes. There have been so many serious, professional artists, photographers, museums, galleries, and other organization that have used flickr. Many will find a more user friendly site to properly display their works. I was on Flickr years before entering SL and I am curious to see where the professionals go because I will definitely follow. SL is fun to see on Flickr but what has kept me there has been the RL photography. Is it only me who has problem loading new pages, and searching? It is so slow that search is practically useless. I hope it’s a start problem. You’ve only seen a couple of complaints? Well, here ya go. Thanks for the response, Gogo. I’m glad pro gets to keep stats. But it seems odd to me that Pro has a smaller image size limit. I don’t really need the big size anyway, but why would it be that those who pay get the worse end of that deal? seems fishy. I’m not a fan of the new design. Maybe because I tend to photograph locations and things, I like being able to see the titles of works, and now I have to hover over photos one by one to see the titles—and descriptions aren’t visible at all unless we click through. For those of us who create images we think of as standalone art (not to sound overly pompous), the lack of negative space around them is an issue—there’s a reason why in art galleries we don’t have wall-to-wall images. Flickr now looks more like Google image search than a site where single photos can stand on their own. On the individual photo views, we now have to scroll down to see comments, and even then have to click repeatedly to see all comments, and sets and collections are likewise less accessible. As for the high res display—with a wide monitor, I really don’t want to see every image full size (they are HUGE, and some images are awful of course)—I’d rather have the option to view smaller images and click on those that interest me. The Flickr help forum, to which Sylvan points, is home now to more than 23,000 comments on the new design. There is generally some outpouring of criticism when sites roll out new designs or interfaces, but these are overwhelmingly negative. I think there’s some legitimate concern expressed there that the interface changes might actually reduce the sense of community because of the deprecation of comments and so on—we’ll see I suppose. But to answer your original question about pro vs. the new pricing plans, I’ll probably renew my pro account (haven’t yet, waiting to see how all this settles out) because I don’t want to lose statistics.